Having gone to school in New York, I’m often asked why I decided to come back to the Midwest after graduation. One of the main reasons I came to Milwaukee to start my professional career was due to the city’s history and optimistic future with water and water technology. 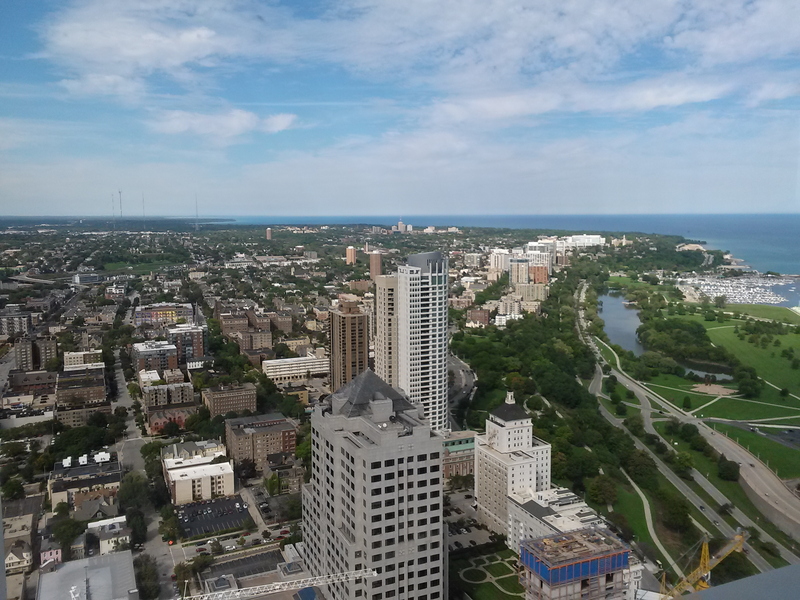 I thought I’d spend this post by (very) briefly covering the history of Water in Milwaukee so that readers gain a greater appreciation for Milwaukee, and just urban water management in general. When they occupied the area, the Potawatomi Tribe called the land manwaking, or when loosely translated, “gathering place by the water.” Due to its location where the Milwaukee River meets Lake Michigan, the site became a popular destination for European fur traders. Eventually, three different towns sprung up around the Milwaukee River, the leaders of these towns are now known as the Founding Fathers of Milwaukee: Solomon Juneau of Juneautown, Byron Kilbourn of Kilbourntown, and George H. Walker of Walker’s Point. These three men did not get along, especially Juneau and Kilbourn (there’s even an event called the Milwaukee Bridge War), but eventually in 1846, the towns combined to form the city of Milwaukee, with Solomon Juneau elected as the city’s first mayor. Main industries of the area centered on the use of the rivers and lake. Tanneries, paper mills, and most famously – breweries – all became major economic drivers of the city and surrounding area. All these industries required large amounts of water in their production processes, and wastewater from these processes was returning to the rivers untreated via combined sewer networks, eliminating the wild rice industry all-together. By 1900, the Milwaukee River was horribly polluted with industrial and municipal waste. Seeing as the city of Milwaukee’s drinking water was supplied by Lake Michigan, and the Milwaukee River flowed into the Great Lake, it should come as no surprise that in 1909, a deadly typhoid scare swept the city. This water-borne disease acted as a catalyst for the city to re-examine its relationship with the water it so heavily relied upon. In the first half of the 1900’s, Milwaukee served as the flagship for the socialist movement in the U.S., electing three socialist mayors and starting the “Sewer Socialists” movement. Thanks to this group’s leadership that the city emerged as a leader in city sanitation and public health by cleaning and upgrading the city’s sanitation, water, power and education infrastructure. During this time, the creation of the organization now known as the Milwaukee Metropolitan Sewerage District (MMSD, which coincidentally, is also the acronym for the Madison Metropolitan School District…two very distinct and different entities not to be confused with each other) was formed to oversee all municipal water and wastewater systems. Milwaukee was an early adopter of the activated sludge process – a wastewater treatment method that harnessed microorganisms to consume pollutants and which is now a staple of wastewater treatment plants everywhere. This pilot plant was built on nearby Jones Island – the present home of the Jones Island Water Reclamation facility and a designated National Historic Civil Engineering Landmark. It was also during this time that even more Europeans and many African Americans immigrated to the city, turning the city into a major industrial hub and the 11th largest city in the country by 1960. However, like many industrial cities on the coast of the Great Lakes, the loss of “blue collar” jobs and industries combined with many Milwaukee citizens leaving the downtown area for suburbs, resulted in decentralization, segregation, and general degradation of the city. It seemed like the age of prosperity for Milwaukee had ended. In 1993, Milwaukee was once again plagued by a water-disease outbreak. This time, the parasite cryptosporidium had found its way into the water supply of the Howard Ave. Filtration Plant, causing the death of roughly 100 people. This event spurred the increase in water quality monitoring and protection processes by adopting ozone disinfection. The Howard Ave. Plant received one of the largest ozone retrofits in the world at the time. Seeking an avenue for urban revitalization and economic development, Milwaukee realized that water had long been the source of economic prosperity in the region. Even with the decline of factories and the industries that supported the city, Milwaukee had the expertise and resources to become not only a national leader, but a global leader in freshwater technology. With funding from both private and public sources, the Water Council was formed in 2007 as an organization to support water technology startups in the area. Already a home for water technology companies that supported major industries, Milwaukee re-positioned itself as a hub for the latest and greatest. The city has been designated as a UN Global Compact City for its freshwater expertise, and houses one of three Schools of Freshwater Sciences in the world (the other two are located in the Netherlands and Singapore). Demonstrating commitment to public water quality, MMSD completed a $1 billion dollar Overflow Reduction plan in 2010 which involved the construction of additional Deep Tunnels to provide additional stormwater holding capacity to prevent combined stormwater/sewer overflow. In addition, the organization has heavily invested in green infrastructure projects to compliment traditional grey infrastructure and acknowledge the complex, interdisciplinary relationship of water quality and management. Milwaukee’s relationship with water is not by any means unique. Many cities grew up near bodies of water, and in the early 1900s, utilized water resources with little care for how wastewater would affect the surrounding environment. As the environmental movement gained traction throughout the country, wastewater treatment became a necessity throughout. However, as many cities become complacent with the current state of water infrastructure, Milwaukee has decided to set its sights on higher goals. Whereas the beginning of Milwaukee’s history relied on the use and overuse of its water resources, The future of Milwaukee relies on the responsible and innovative use of water globally. Its position both physically on the coast of one of the world’s largest bodies of freshwater, and historically as an industrial engine of water-based industries, has attracted technology start-ups, academics and water policy advocates from all over the world. It is the city’s hope that Milwaukee will emerge as a beacon of economic, social and intellectual revitalization by forging a new relationship with water. Previous Previous post: How smart does a “Smart City” make us? Next Next post: Birthday Fundraiser!